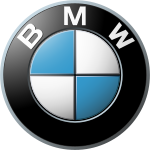 BMW AG (a cutty furm o Bayerische Motoren Werke AG), is a German automobile, motorcycle an ingine manufacturin company foondit in 1916. It an aa ains an produces the MINI brand, an is the parent company o Rolls-Royce Motor Cars. BMW produces motorcycles unner BMW Motorrad an Husqvarna brands. BMW is kent for its performance an luxury vehicles. ↑ "When was BMW founded?". BMW Education. BMW. Archived frae the oreeginal on 25 April 2012. Retrieved 30 September 2012. ↑ 2.0 2.1 2.2 2.3 2.4 2.5 "Annual Report 2014" (PDF). BMW Group. Retrieved 20 July 2015. Wikimedia Commons haes media relatit tae BMW.